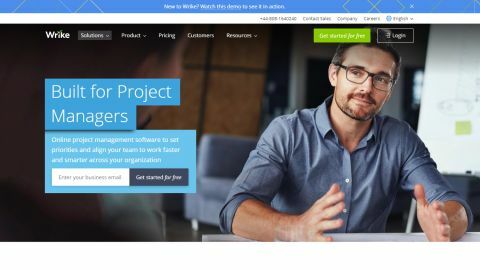 Wrike is an easy to use project management tool which integrates with a huge variety of applications. It’s not cheap, though, and is somewhat let down by its lack of an integrated chat feature and fairly bland UI. Wrike was founded in 2006 and is based in San Jose, California. It’s cloud-based project management software suitable for larger teams, and geared towards small-to-medium-sized businesses and enterprises. The solution includes Gantt charts, its own Document Editor, calendars, a workload view for resource management, multiple dashboards and real-time updates. It integrates with a variety of third-party applications including Salesforce and Dropbox. The platform’s also available as a mobile app. Wrike offers five different pricing plans including a free tier – plus you can try each package free for 14-days. The ‘Free’ tier includes five users, a board view, task management, file sharing, real-time activity stream, spreadsheet view, basic integrations and 2GB of storage space. The ‘Professional’ plan starts at $9.80 (£7.70) per user per month. This includes all the free tier has to offer plus up to 15 users, Gantt charts, advanced integrations, shareable dashboards, collaborators, 5GB of storage space and 15GB of monthly video uploads. The ‘Business’ package is $24.80 (£19.40) per user per month. This has all the features of the ‘Free’ and ‘Professional’ tiers along with up to 200 users, custom fields, workflows, shared real-time reports, report templates, graphical analysis, calendars, request forms, time tracking and 50GB of storage. The ‘Marketers’ tier pricing is available upon request and is geared towards marketers and creative teams. It caters for an unlimited number of users and includes all the aforementioned features plus Wrike Proof, Publish, an extension for Adobe Creative Cloud and a tailored workspace. The ‘Enterprise’ solution has advanced security and controls. Pricing is also available on request. Setup is a fairly straightforward process. We decided to go with the free trial for the ‘Professional’ plan. Once you confirm your email, you’ll be asked to enter your name, phone number, business email and company size. After this you can decide whether to invite teammates or wait until a later stage. Wrike walks you through some of its features before you reach the main dashboard. You can decide which template best suits your needs. The categories available are General Purpose, Marketing & Creative and IT & Engineering. You can then name your project. Once all this has been completed, your workspace is ready. Wrike will launch a ‘Getting Started’ video. After watching this, you will be taken to the main interface. In our case, we chose an event management template. This displayed our chosen project and any tasks scheduled. The interface is clean and simply presented. Your Team, Personal, Shared, and the project are displayed on the left-hand side of the main interface. You can access your Inbox, Work, Dashboards, Reports and Stream from the top of the screen. Wrike offers users handy tips from the panel on the right-hand side of the screen. You can also share your opinion about the platform through Quora, Twitter and Facebook. Wrike Assist can be accessed at the bottom-right of the dashboard. This displays numerous articles on how to use the software, and is also where you can access live chat. Your chosen template can be easily changed using Wrike Assist. While the layout is easy to use, it’s not as in-depth as some competitors such as Liquid Planner. Wrike sports multiple dashboards. These are available through the Dashboards tab at the top of the screen. It displays projects that are not started yet, overdue projects, and those that are due this week by default. However, you can add more dashboards for each project your team is involved in. Users can also add widgets to their dashboards. These can show various folders, tasks or files related to the project. You can choose from Project Widgets, Files, Active Tasks by assignee, by status, Pending Reviews, Backlog, Conflicts Monitor, Activity Monitor, Starred, Personal, Overdue and Followed Tasks. Wrike also supports customizing widgets to suits your needs. Wrike incorporates Gantt charts which are interactive with a handy drag and drop feature. Settings, the project title, start and due date, predecessors along with a calendar are displayed on the main screen. You can hide folders and highlight any overdue projects. Users can collapse and expand columns, or filter reports into active, finished, on hold and cancelled. Extra filters included are assignee, to do, reviews, task type, due/start date, last modified, created, completed and author. Information is viewed in list form more so than in a graphical format. A Document Editor also allows users to edit files, PDFs, and mark-up images in Wrike without needing to download them. The Editor needs to installed directly onto your drive. However, this is worth doing – you can open uploaded files and make changes. These changes will be saved automatically in the same location as the original. Furthermore, the Editor logs your version history. It’s compatible with OpenOffice, PDF, JPG, PNG, Adobe Creative Suite and Microsoft Office file formats. Finally, it’s worth noting that Wrike integrates with a variety of applications. These include Wrike for Windows and Mac, Wrike To Do, Outlook, Office Timeline, Word, Slack, Gmail, Hangouts, Zapier and GitHub. There is also a Chrome extension, and mobile apps are available for both Android and iOS. Wrike works well for users who want a quick and easy setup. It has all the basic features needed to create and collaborate on a project, with a handy Document Editor that makes it a breeze to work on files and save changes. The multiple dashboard feature is very useful for teams who work on numerous projects at once. All dashboards can be viewed at a glance, and overall the interface does everything you need, though it is rather bland. However, on the downside, Wrike is more expensive than Zoho Projects which offers many more features. Still, this remains a good project management tool which integrates with a huge number of applications.